Once again it is time for the Rudolph Days Challenge. Here is a recap of the rules for your perusal. 9. A special draw will be held at the end of the year, in December, for all those who submitted a card or project every month that year, January to November..
Our talented designers have been so busy creating beautiful inspiration for you all. Jenny has made us the sweetest upcycled Rudolph card ever! Perfect for a challenge named the Rudolph Days Challenge. I love that beautiful corner diecut...one can never have too many corner cuts! Next up is Sam at Whispers Cards blog. Sam's card is a pretty penguin scene with lots of realistic snow! I am looking forward to reading how Sam made that snow! I love the snowflake die cut at the top! I had a long snippet of blue card and wanted to make a card that relied heavy on snippets for the design. I used my trusty Martha Stewart punch and made short work of that long piece of card! Using a paintbrush, I went over each snowflake with Waterfall Blue Stickles, just to give a little Christmas sparkle! I folded a die cut circular snippet into halves and quarters to guide my snowflakes into a circular shape, as well as using the fold marks to guide how close together to place them. A few larger diamond bling finished off the wreath quite nicely, and then used my scoreboard to made two sets of lines to frame the wreath. The grey bow has been in my drawer for years. It came off a box of something, so long ago I can not even recall just what it was! The merry christmas sentiment is a Studio G stamp...it was just the right size! The card used here is from a VOS package of 5 1/2 inch square cards and envelopes. This one, and many other card packages like it, were purchased before I made cards and learned that heavy weight card bases are better. So I made the wreath on piece of white card and added it to the front of the card base. I then added extra layers of DP to the inside, to make the card "stiffer". The grey snowflake DP is DCWV Frosty Holidays, and the shimmery blue sentiment mat from that paper pad as well. The sentiment was diecut from another snippet of the laser photocopy paper and the stamp is Darcies Country Crafts J1120. It is VOS...1995! The large snowflake is Memory Box Bianca Snowflake and was cut from another snippet of the lazer heavyweight photocopy paper. I gave it a generous coat of clear Wink of Stella. So three snippets of the heavyweight laser paper and one long snippet of the blue card and Voila! A card is born. 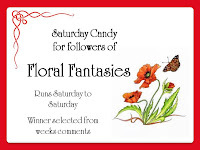 I am taking this card over to Di's at Pixies Crafty Workshop where you must use at least one snippet. 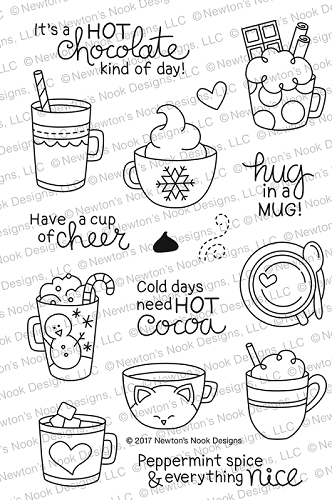 or this Newtons Nook Cup of Cocoa stamp. Fabulous cards from the DT and I love your snowflake wreath - a great use of snippets too! Wonderful inspirations from you and the DT ladies! Your snowflake wreath is so clever and looks delightful! Very accurate work and the inside compliments it perfectly as well the envelope! Jenny's card is soooo cute and lovely and I'm stunned by Sam's card, that snow really pops! Thanks for a new challenge, hope to have time to play in. Oh your card is gorgeous and I love the blue snowflake wreath it's so stunning and very beautiful. Super inside also and tht verse is brilliant. It must have taken you ages to create that wreath. Fabulous DT cards Mo and your wreath is just stunning! I do hope your arthritis flare up has settled down now. I love all the wonderful cards created to inspire us. You all did a fantastic job on your creations. Fabulous card Mo, love that snowflake wreath and the inside is super too. Everyone's cards are so sweet! I love wreaths (I'd collect them if I had room to store them! lol). 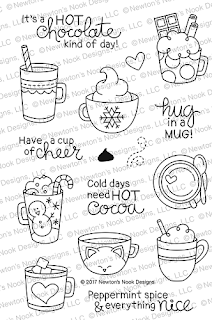 Thanks for the new challenge - lovely DT creations - Loving that Newton's Nook Stamp for a win - someone is going to be doing that Happy Dance! Thanks for the challenges - so far I have made it each month! Yeah! Awesome cards ladies. So cute! Thanks for reminding us to keep on making those Christmas cards through the year. I love your beautiful blue wreath and the fun prizes. Can't believe how fast the challenge comes round. Lovely DT cards. Cute and pretty cards by everyone! Absolutely lovely snippets card from you Mo! Clever how you placed the snowflakes so perfectly as well. Great to see in the Playground! Gorgeous cards this time - but I love that snowflake wreath! I am trying really hard to get my Christmas card box looking healthy. Thanks for helping! I love your wreath and there's fabulous inspiration from the design team! Love your snowflake wreath, Mo! I'll bet it's even prettier IRL when you can see the sparkle! You've done an amazing frame on the score board too! It's perfect to show off that pretty wreath! such colourful and festive cards from the DT and i love how you scored the frame around the wreath, maureen! Beautiful cards & they all go together like you knew what the others were making! Stunning inspiration from everyone! I love your snowflake wreath! April has really flown by hasn't it? Fabulous inspirations from the Dt ladies and your wreath looks wonderful, such great idea you have had! Yay! I made it in time! April is a short month and the time flies these days! Thank you for another Rudolph Days and the inspiration to get me making my holiday cards! You and your team made some gorgeous cards! I love how you used your punched snowflakes to form a wreath - gorgeous! Thank you for inspiring! Yay! I made it this month! Such sweet creations by the DT. I always love your challenge as a reminder to keep working on my Christmas cards! The design team cards are all beautiful and I really like your elegant wreath design. I just uploaded my card and don't remember if I left a comment earlier. I thought I did but don't see it..so here I am again! Your wreath is so pretty and I wouldnt have know it used punched snowflakes if you hadn't told us. What a creative idea and beautiful result. I just made it before the deadline! Thank you for the fabulous challenge and inspiration. Lovely cards by everyone!! I especially am enthralled with your beautiful snowflake wreath!! Gorgeous!! Thank you for another Rudolph Days challenge. 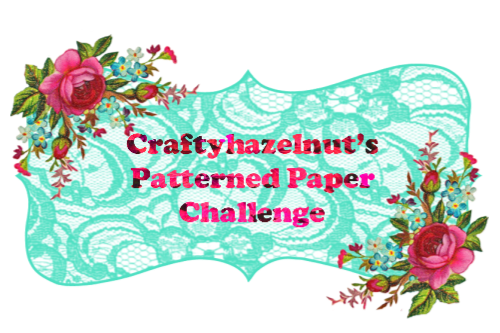 Love this challenge!!! of course not happy slipping in at the tail end of it. But it's done. Sad I think I missed January for some reason or other.